To celebrate the arrival of Jolly Old St. Nick, Outlets at Castle Rock hosts a special family-friendly celebration on Saturday, Nov. 17 from 8:30-10:30 a.m. dubbed ‘Santa’s Big Day.’ The morning begins with a pancake breakfast with the Big Guy Himself (Santa), by Flippin’ Flapjacks, in the Food Court. All donations benefit Denver Rescue Mission. The event will also include children’s Christmas coloring activities, sleigh rides, and even real reindeer! Breakfast will be served from 8:30-10:00 a.m. with Santa, Sleigh Rides and real reindeer will be available from 10-11:00 a.m., and at 10:30 a.m. the Elves will kick the annual off Run Run Rudolph Scavenger Hunt. Breakfast is $5/person, a donation directly to Denver Rescue Mission. Or, instead of a monetary donation, you can bring a new or gently used item to be gifted to a family in need for the holidays. A list of items needed is below. On Sundays, Dec. 2 and 9 from 10 a.m. to 11 a.m., Outlets at Castle Rock will host two “Santa Cares” events, providing children with special needs a warm, quiet environment and sensory activities to help reduce behavioral triggers associated with this bustling time of year for a perfect picture with Santa. The center will be providing a warm and quiet wait space, eliminating the need to stand in line and providing special activities such as coloring books and special sensory books from the Douglas County Library that will keep children engaged and prepare them for their visit with Santa. Registration is encouraged; however, walk-ins are welcome. On Sunday, Dec. 16 from 8 p.m. to 9 p.m., shoppers are invited to bring along their furry, feathery or fuzzy friend for a special “Pet Night with Santa” photo opportunity. Guests are asked to be sure pets are on leashes or appropriate harnesses. All friendly pets are welcome. Santa Claus will be posing for complimentary photos from Nov. 17 until Christmas Eve. Professional photo packages will also be available for purchase. Hours vary and can be found at outletsatcastlerock.com. 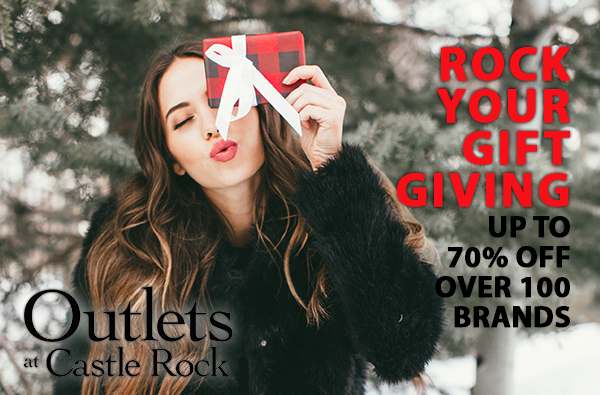 Outlets at Castle Rock is conveniently located between the Denver Metro Area and Colorado Springs region at I-25 and Exit 184 and Exit 185 in Castle Rock, Colo.